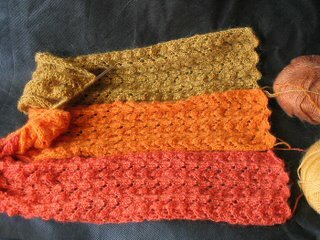 I knitted three panels in this beautiful lace pattern (they're now finished, the photo shows the previous stage), they are about 70 cm long and 20 cm wide each. They are so short, because I ran out of a yarn (I had several old skeins of each colour from somewhere and there is no way I could buy more of the same colours now!...). I thought I would sew them together along the longer sides and make a kind of a shawl, but it'll be too short even to hang on my shoulders. Then I thought about sewing them together along the shorter sides and make a 2-metre scarf, but I think this lace pattern needs more exposure than just being wrapped titghly around the neck. Hi, just found your site from your comment on Desi Knitter's blog. Your knitting is beautiful. I have 1/2 Polish ancestry so it is fun to read about someone who lives there. I'd love to see your country some day. As for the lace panels, maybe you could make a big square pillow. You would probably have to put some nice backing fabric behind the lace though. hello, found your blog through your comment on mine. your scarves are gorgeous! i would go with your suggestion of joining the short ends together, because the colour scheme would look great, and the yarn looks totally luscious. if you wear it without wrapping it around your neck the pattern will definitely show. i also like your red cape, beautiful work!